OMG! Guys! I am so excited about the mini-series I have planned for this summer! You all know me and my themed weeks and the utter enjoyment I get from these simple things, but this is 10x better! At the end of last summer I did a kids themed week. It was so much fun and I got a ton of positive feedback from readers, that it got the wheels in my head turning. Since (heck even before those blog posts last summer) I have been brainstorming and collecting ideas for kids in the kitchen. I soon had enough ideas to do another kids in the kitchen week and soon enough another. Then all the way back in March I decided it would be fun to do the next kids in the kitchen week in the summer, when the kids were out of school for the summer. Since I had so many ideas that equaled more than a week I decided that every Friday of this summer should be deemed ‘Fun Friday’ aka ‘Kids in the Kitchen’ day. So every Friday for the next 10 weeks I will be sharing some fun things for the kids to do in the kitchen. Unlike the last kids in the kitchen series, where I focused more on tips towards for parents to help kids be less picky eaters and help in the kitchen; this series for the summer is just for the kids. There will be kid friendly recipes that they can make themselves (with adult supervision), kids kitchen crafts and food gifts, science experiments, books about food for kids, foodie field trips, culinary staycations, and much more! Hold onto your hats kids this is gunna be fun! First up, are some simple science experiments involving food and the kitchen. I actually put this together this past Spring when I was asked to be the ‘celebrity’ chef at a local elementary school and to come speak to the kids as part of their Science Fair Day. I spoke on the science of cooking and performed several different experiments. Below are a few of these experiments and the talking points. These are great experiments that kids of all levels can enjoy (perfect for summer learning or even homeschooling)! Pour equal amounts water into each glass, until it is about ½-2/3 full. In one glass of water, stir in about 3-4 tablespoons salt. 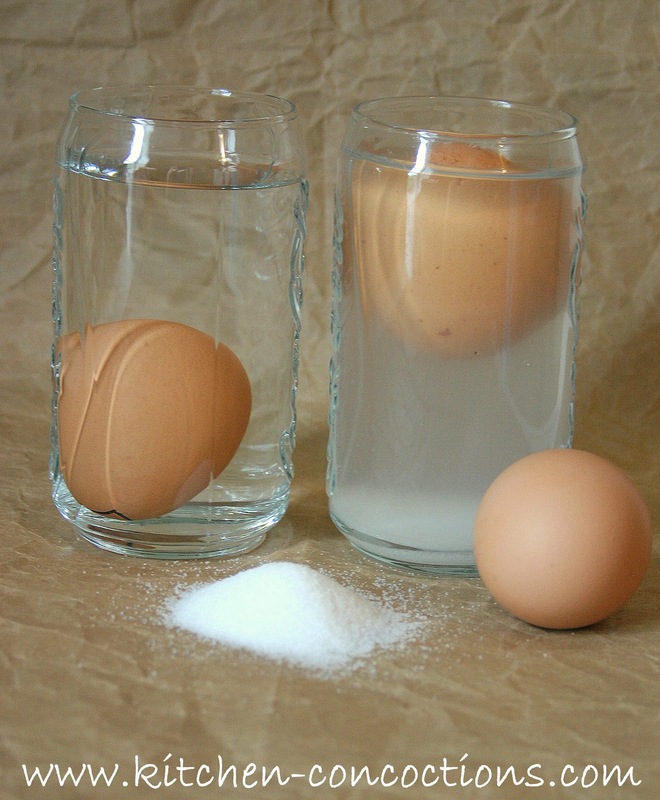 Gently lower one egg into the salt water and one egg into the plain tap watch. Salt water is denser than plain tap water, the denser the liquid the easier it is for an object to float in it. When you lower the egg into the plain tap water it drops to the bottom. As opposed to when you lower the egg in the salt water in floats on the top. This happens in the ocean or in salt water lakes, as well. Things will float more easily in the denser salt water as opposed to fresh water lakes or rivers, where similar items will sink. Spin the eggs. 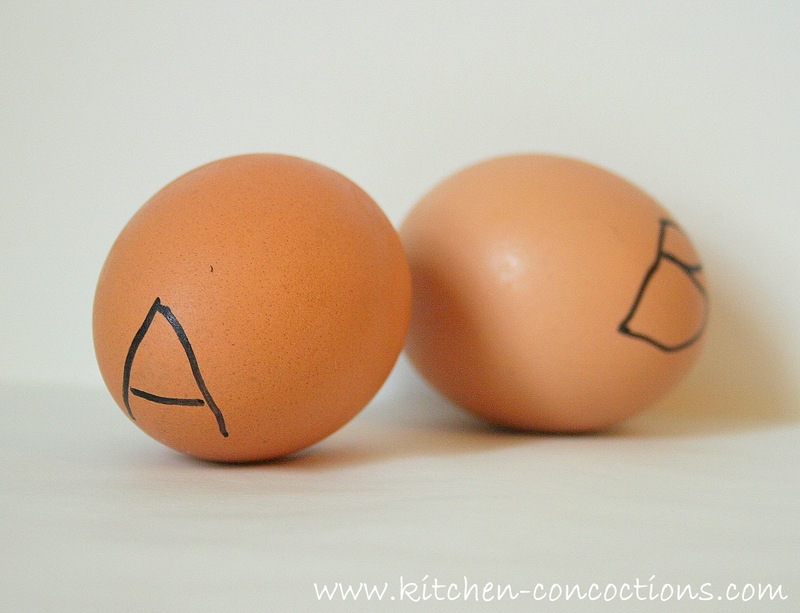 One egg should spin while the other wobbles. You can also lightly touch each of the eggs while they are spinning, one should stop quickly while the other keeps moving after you have touched it. The raw egg’s center of gravity changes as the white and yolk move around inside the shell, causing the wobbling motion. Even after you touch the shell it continues moving. This is because of inertia, the same type of force you feel when you change direction or stop suddenly in a car, your body wants to move one way while the car wants to do something different. Inertia causes the raw egg to spin even after you have stopped it, this contrasts with the solid white and yolk of the hard-boiled egg, it responds much quicker if you touch it. Fill the jar 1/3 of a way with water. Add 1-2 drops of food coloring to the water. Add equal amounts of oil as water to jar. Notice how the oil floats on top of the water. Put the bottle back down and have a look, it may have seemed as though the liquids were mixing together but after a few seconds the oil will float back to the top. Now add 1-2 tablespoons mustard to the jar. Shake jar again and notice that the oil and water mix together. 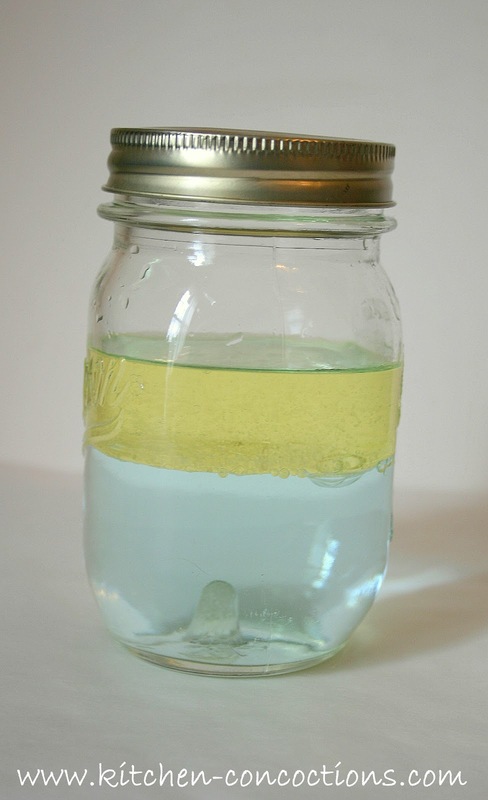 While water mixes with most liquids, it does not mix with oil. This is because water has very strong molecules that are attracted to each other and oil has very strong molecules that are attracted to each other. Because both water and oil have such strong molecules they won’t mix, and repel each other. Since water is less dense than water it flats to the top. 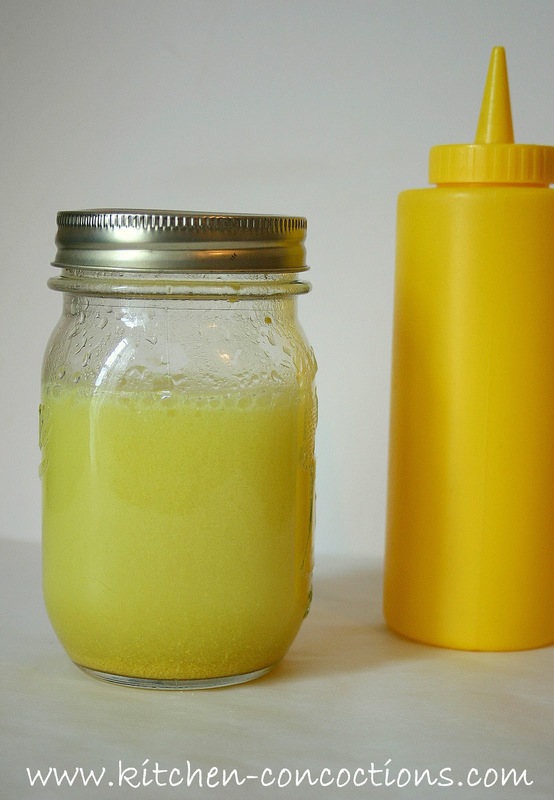 When you add the mustard, it helps bind the water and oil molecules because the mustard is attracted to both. This is called emulsion. Fill glass full of ice. 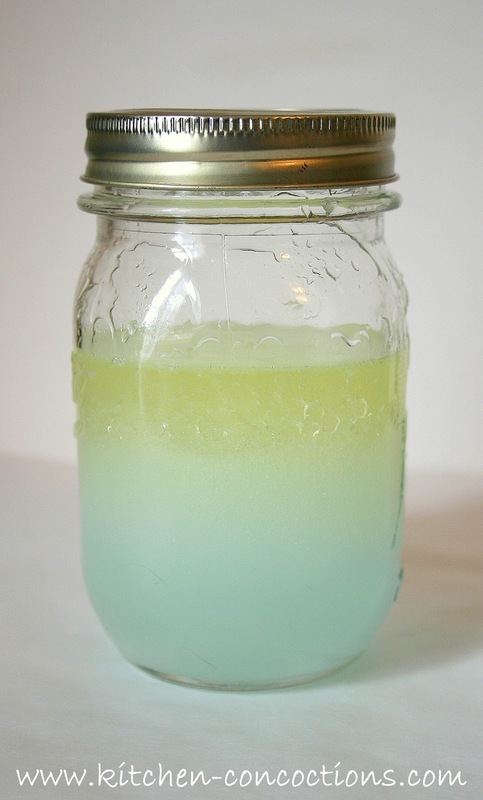 Pour drink with highest sugar content (Lemon Lime Gateraide) slowly into cup, filling glass approximately 1/3 full. Next pour drink with the lower sugar level (Fruit Punch G2 Gateraide) slowly into glass filling glass approximately 1/3 full. Last add sugar free drink (Sugar Free Blue Raspberry Hawaiian Punch) and fill glass the remaining way. The drink with the most sugar, Lemon Lime Gateraide, is heavier and more dense and therefore sinks to the bottom. The drink with less sugar, Fruit Punch G2 Gateraide, is lighter and less dense and therefore floats on top of the heavier drink with more sugar. And the sugar free drink, Sugar Free Blue Raspberry Hawaiian Punch, is the lightest and will float on top of the other drinks. These are great! I've been searching for kitchen science activities which actually relate to working in the kitchen v's experiments which you can simply do in the kitchen but with little to no practical application in the kitchen. Thank you! I wish you could put some more up! Hi Anonymous! Thank you for your comment! I will actually be sharing more ideas like this over the summer when I bring back my 'kids in the kitchen' series. So stay tuned! The key is you have to have ice. I did this as an experiment in a school with kids and it just mixed and changed colors without ice. Yellow & red made orange, blue made it purple, yellow and blue made green. Ice helped keep it separated for some reason. Pretty cool stuff. It's nice that it's all done with stuff you can find around the house. 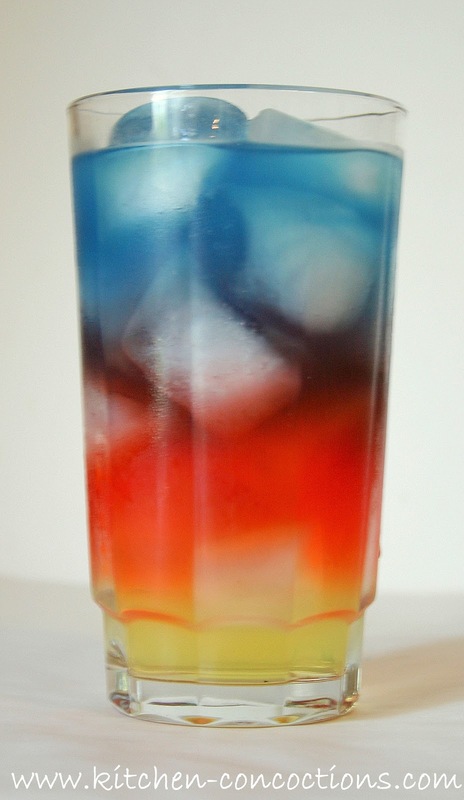 That layered drink looks awesome.